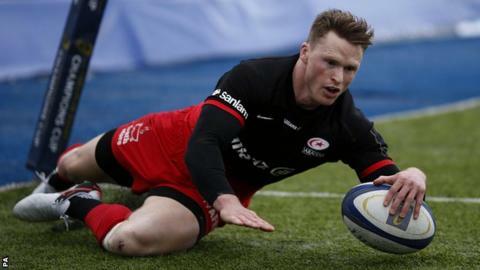 Chris Ashton grabbed a hat-trick as Saracens scored eight tries to earn a bonus point win over Oyonnax in Pool One of the European Champions Cup. Winger Ashton, who was not picked for England's World Cup campaign this year, scored twice in the first half before completing his treble late on. Samu Vunisa crossed twice, while Alex Goode, Mike Ellery and Jamie George also went over for the group leaders. Oyonnax could only earn a second-half consolation through Fetu'u Vainikolo. The results means unbeaten Saracens have all but qualified with a home quarter-final in the competition. They have picked up 19 points from four games in Pool One and have a 14-point cushion over second-place Ulster, who play Toulouse on Sunday and have another game in hand. Oyonnax sit bottom of the table, with only a losing bonus point to their name. Sarries ran in six tries against the Top 14 strugglers in the reverse fixture last week, and winger Ashton said he was feeling the pressure after missing out on crossing the whitewash himself. But with the Six Nations approaching, and a new England coach to impress in Eddie Jones, Ashton made sure he displayed his attacking prowess in front of a home crowd. All three of his tries against the French side came in the right corner, and all three were set up by fellow England internationals. Full-back Goode fed to Ashton for the opener, and it was Owen Farrell's delicate chip through which set-up Ashton's second of the game before the break. Winger Ashton finally grabbed his hat-trick on 75 minutes when another chip, this time from scrum-half Richard Wigglesworth, sent him over. Premiership leaders Saracens are unbeaten in all competitions this season and have now amassed 159 points from four European games. Mark McCall's side were not at their best in the first half against Oyonnax, and it showed when they conceded two penalties on the back of Ashton's double, which fly-half Regis Lespinas converted. But the first of Vunisa's two tries gave the hosts a comfortable 20-6 lead at the break. Sarries upped their second-half performance and landed four tries in 18 minutes. Vunisa's second from a line-out drive opened up their lead, before Goode split the defence and ran 55 metres to score, and former England Sevens man Mike Ellery added another with similar blistering pace. Saracens' concentration lapsed again, and Vainikolo was able to race over the line after intercepting Charlie Hodgson's pass, but the result was already out of sight. Saracens wing Chris Ashton: "We go into every game trying to win it and we are in the position where we wanted to be after four games in this group. "We have a couple of tough games coming up but we are just taking it week by week." Oyonnax fly-half Regis Lespinas: "It was hard for us, the try just before half-time killed us. "We would have been happy with 15-6 at the interval but to go 20 points behind was too much for us." Saracens: Goode; Ashton, Taylor, Barritt (c), Ellery; Farrell, De Kock; M Vunipola, Brits, Du Plessis; Hamilton, Itoje; Wray, Brown, Vunisa. Replacements: George for Brits (21), Wigglesworth for De Kock (49), Ransom for Goode (49), Barrington for M Vunipola (49), Figallo for Du Plessis (49), Rhodes for Itoje (55), Hodgson for Farrell (55), Fraser for Hamilton (62). Oyonnax: Denos; Ikpefan, Bousses, Tawalo, Vainikolo; Lespinas, Blanc; Delboulbes, Maurouard, Clerc; Power, Fabbri; Ursache, Wannenburg, Faure. Replacements: Wright for Delboulbes (19), Pungea for Clerc (47), Maafu for Faure (49), Martin for Tawalo (52), Clegg for Lespinas (52), Jenneker for Maurouard (58), Aziza for Blanc (62), Bordes for Ursache (65).